Changed out the water pump gaskets. Then spent the afternoon cleaning up the driveway. must have been a common thing yesterday as I did mine also. Glad I have efans and an air compressor with the right tools. Took all of 20 mins for mine. E fans make everything a pleasure to do. is that goat pee ,no its goat gatorade. Got back from the body shoptoday after running over Bambi! Gave mine to my girlfriend to drive for the next few days. Her BMW is on the fritz (guess who gets to figure that out?) so I loaned the Av to her. I'm happy she gets to drive it - I love it and I bet she will too. She hates automatics (her car is a 6-speed manual), but I think she'll dig it nonetheless. The Bimmer appears to have a bad coil pack or fuel injector on the #4 cylinder, which I'm motivated to fix quick so I can get my truck back! You loaned you AV to the GF, heck you may never get it back. I will, she likes her Bimmer too much (when it's working - have had a bit of back luck with it recently). So fresh I haven't even had time to clean the new tires and wheels. '12 Avy/LT/4x4/All Star Edition. Iron Bull bumper. 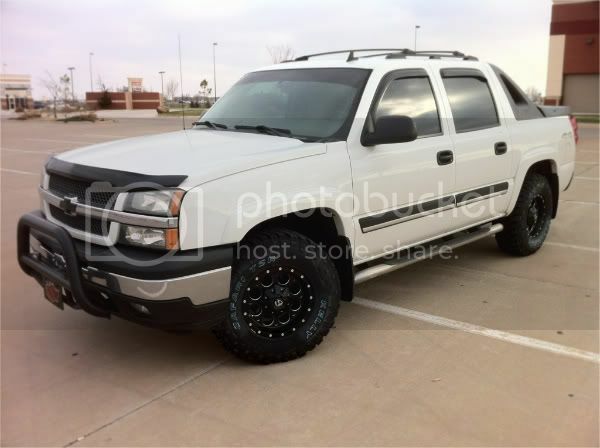 Rough Country 3.5" lift, ProComp PXA7089, 285/70/17 Nittos. Lights-LED spot,fogs,bed,underglow, rear strobes, Painless dual battery setup . Damn things cost $17 each but $8 off if you buy two at Advance Auto. It's 10o and the sign said they would install them for FREE The plastic releases on my old blades were frozen so I beat them with my ice scraper handle. Young guy trying to replace the blades for me cracked up laughing. Twenty fingers were numb but I got it done alot quicker with four hands. Put new front half-shafts on yesterday. This morning, my 10 year old and me R&R the transfer case and put in the MA upgraded pump housing. It took us about 4 hours and was a great father-son bonding project. As it turns out, there was no damage at all to the clip or the housing. At least now I don't have to worry about it anymore. get all the time in you can while they are still young..I have a 16 year old and now I never see him. He is always with his girlfriend. Guess the girlfriend is cooler then hanging out with dad... Miss the days when he was still around. But every now and then he still likes workign on the AV with me. Over the weekend I installed both the easylift torsion spring, and the ez down cylinder. Both made the tailgate basically effortless. Unloaded everything. Getting a 2011 demo Wednesday. Trading a 07 LT, 2 wheel drive with under 36000 miles on it. Alot sturdier platform than a shaky ladder and you don't have to carry it. I cleared an intermitant engine code fault by tightening the gas cap. I always tighten the gas cap, I guess not tight enough the other day. oops!